Do you want to paddle your kayak in Finland? 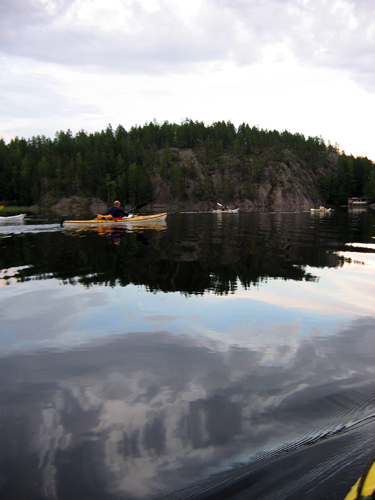 Finland is a paradise for kayakers and canoeists. There are a hundred thousand lakes, thousands of islands, plenty of rivers and about 1 500 km sea shore. What makes Finland special is everyone’s right of access to water and unhabited land areas. That makes kayaking and canoeing expeditions easy to paddle and plan as long as you read a map, pay attention to the weather and and follow the guidelines for the everyone’s rights of access. Our club also has two classical routes – the Blue White Ribbon and the Archipelago Ribbon – anyone interested in those may paddle the routes and get a diploma for that. The Blue White Ribbon is given to those, who paddle the whole lenght of sea shore, approximately 1200 km as a minimum, during one summer. 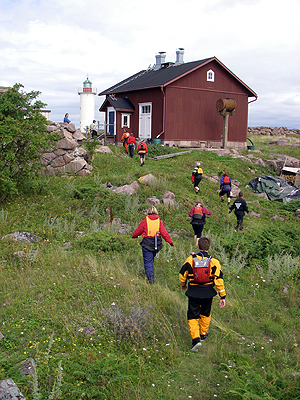 The Archipelago Ribbon is a cultural history adventure on the South Coast and about 650 km of paddling to fortresses and places of Finnish history. The starting and finishing points are preset, and please ask for the ”rules” for the diplomas before setting off. A third route will be opened soon – on the lakes. The sea shore archipelago is nice, and the more demanding the further away from mainland you are. The islands are a maze, which is great, but also requires immaculate navigating skills. There are open crossings and boat lanes as well. The boats come near to kayaks, so you also need to know the international rules of marine traffic. The sea areas are called The Bay of Finland (Suomenlahti in Finnish), Archipelago Sea (Saaristomeri), Aland Islands (Ahvenanmaa), Bay of Bothnia (Pohjanlahti, Merenkurkku, Perämeri), this is the order from the South-East to the North West following the coast. 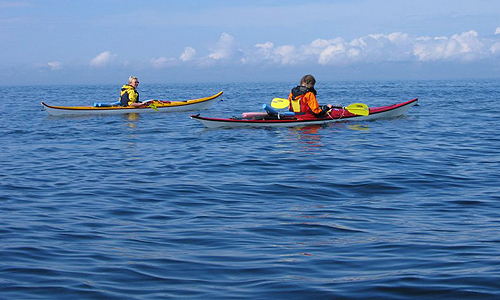 There are five national parks with lovely archipelago where the kayaking is great. Lakes are wonderful. Eastern Finland has large lakes that are connected to each other. Check beforehand, whether that means carrying over a dam or not. A good map is your friend. 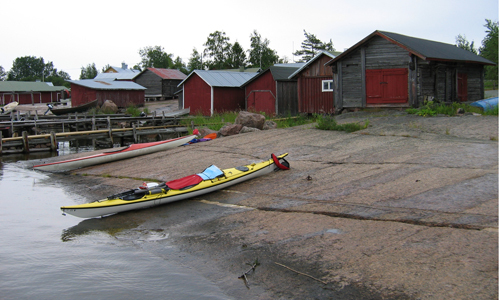 There are national parks on the lakes, like Kolovesi and Linnansaari and it is possible to kayak, as long as you overnight where it is allowed. In Lapland Lake Inari is a good destination, but it is a remote area, rather cold and with a lot of mosquitos. Rivers in the South are smallish for expeditions, in the North like Lapland you can kayak or canoe 200 – 500 km on one river. The white water classification system is the same as in UK, but the national assessments seem to vary a bit. In a project with European Canoe Associations we recognised, that where we over here think a river is class II, for Britons it might be class IV. There are several good white water spots in Finland for surfing and freestyle. Lake expedition routes may include some white waters if the route leads from lake to lake, but it is often possible to walk past those. The biggest obstacles are dams, as Finland produces a lot of energy with water generators. The expedition months are June, July and August. September is also possible. The air temperatures are Northern European, sea coldish, lakes warmer. The day is long in May, June and July, and in the North the sun does not set for a month at all. Even in the South the sun sets only for four hours near midsummer. Later the nights get longer. Normally in the spring ice on top of the lakes and the sea melts in April in the South of Finland. That means that May can be pretty cool on the water and we maybe wouldn’t recommend the spring for anyone not used to paddling in cold environment. In the north some lakes stil have ice topping even in June. The water temps drop in the late summer, and ice starts to build up between November and December. The most dangerous thing in Finland for a paddler is cold water. It will kill if you end up in too cold water for too long a time. Respect that. 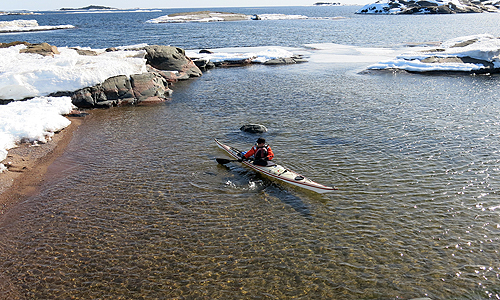 Finns often paddle expeditions and one to three week expeditions are available to anyone. Normally we plan and execute the expeditions on our own, without a paid guide or firm. Of course that might be a good opportunity to a foreigner, to plan and paddle with a pro. But over here, it is not common, as expedition skills are normal skills of every paddler. If you want to have a guided tour, contact a paddling company, guide or outdoor company. If you wish to do something on your own, start by looking at the map and time table, your own skills and then, maybe, contact Finnish paddlers or tourism organisations to get maps of routes. What are your own skills, and in what conditions you have paddled? Can you orienteer or navigate well in an archipelago or wilderness? Do you have necessary maps? Maps variate in different countries, for Finland sea charts are available mostly in 1:50 000 scale, otherwise topographic maps of 1:50 000 are often used. In order to find necessary services like shops, you might need route maps, service and tourist maps on top of that. If you use GPS check that the map and your GPS settings match. What is your endurance in kayaking, how long is the possible day trip to have and enjoy on an expedition for everyone in your group of paddlers. Do you know how to plan food and cooking for an expedition, and, if necessary, where to shop for food. How do you plan to carry drinking water? When planning look first at your timetable, then daily leg lenght, total distance, route. Then review the plan for bad weather, check for obstacles like dams, think about the people in your group and review. The wise paddler plans a trip where the daily must-do leg is shortish, but variation can be added on good weather. The shorter must-do leg and spare days may save your holiday. If you are unsure: join a group led by a seasoned or sea salted expedition paddler. The sea water is salty, you need water. All lakes are not necessarily clean enough for drinking. Always plan always to have three liters of potable water per day. In the warmest part of the summer there might be algae on the water, and there is ”blue algae” that is poisonous. The outbreak of blue algae is tied to warm or hot weather usually. Prepare to cook on the tour, as it is not too warm in the summer. If you are on the water for longer than a day, it is nice to have tea in the evening and warm food. The longer the trip, the better you need to plan. You need breakfast, lunch, dinner and some snacks. 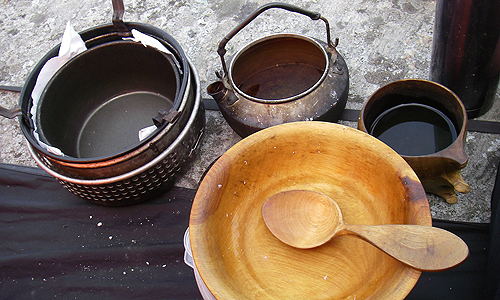 Fuel for expedition stoves: gas cans are sold in outdoor shops and gas stations, alcohol fuel is sold in gas stations, named Marinol and Sinol. In the summer months there are maybe cafeterias, restaurants and shops on your planned route. But as soon as the schools start around 10th August, many of those close or are only open on weekends. Check opening times before leaving for the trip. They are rights and responsibilities. And apply to anyone moving in Finland. The rights allow motorless use of most nature or wilderness areas, including waterways. Also overnight camping in tent is allowed, as long as you leave no trace. So you can kayak, boat and swim. The limits to the right are, that none of your activity may leave a trace. Temporary camping is one night, maybe two nights. Also homes and yards are protected, so you cannot camp in a yard or next to someones sauna by the shore. Use common sense when thinking about the home area: if there is a cottage, boat, and a path to the shore and flowers, it might be home yard. Boat jetties are also private. If someone tells you it is their private area, they are probably right and you should move. In bad conditions go and ask for permission. Other prohibited areas are military areas and nature reserves as well as the bird and seal sanctuaries. Those are normally marked on land, and, on sea charts. Also, it is good to avoid bird islands in the spring, as the nesting might be disturbed. You may not make fire without land owners permission, and if there is a forest fire warning no open fire is allowed even in national park fire places. Taking or breaking parts of a tree or bush is not allowed. Never leave a fire after you – see that it is extinguished before you leave. Always look after your stove also. There is a lot of private roads. The everyman’s right does not allow driving on a private road by car. It is best to park in allowed parking places, for example many boat harbours have those. 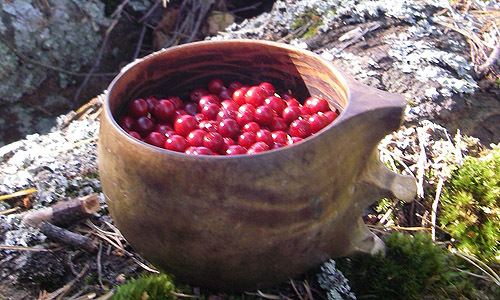 Berries and mushrooms may be picked, as long as you are not in a yard area. If you eat them, make sure you know them. Some mushrooms and berries are poisonous. To locals it is a livelihood to pick berries or mushrooms, so do not tramp on those either. The most dangerous animal is a tick. If a tick fastens itself on your skin, take it off with tick removers (sold in pharmacies) , and it is a good habit to check your skin each evening. Mosquitoes this country has plenty of, annoying insects but otherwise harmless over here. Get some mosquito repellent and you enjoy your evenings. Animals you might meet here are quite harmless. For example moose and deer move mainly in the woods, but you might encounter them swimming over a river or in the archipelago too. There is a traffic warning sign along the roads where these animals move, keep the speed low there. Reindeers are in the North. There are some bears and wolves in mainly Eastern Finland and please report if you see them, as we have never sawn them outside a zoo. Two snake species also exist, the adder is poisonous. The main way to avoid snakes is to walk stomping noisily and look that you do not step on them. A lot of Finns wear wellingtons in the forest, to protects the legs. Boat – from Stockholm in Sweden to Helsinki and Turku and Travemünde in Germany to Helsinki and from Estonia to Helsinki. Car – from anywhere in Europe, mostly combined with boat trip. Finland is about 1 600 kilometers long South to North and at its widest 600 km West to East. The sea shore is about 1 500 km long. 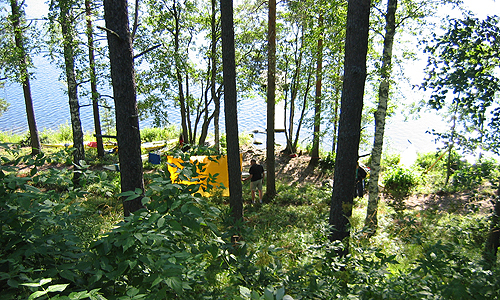 The Finnish Expedition Paddlers’ Association offers three Ribbons, ie. selfsustained journeys along the waters of Finland. 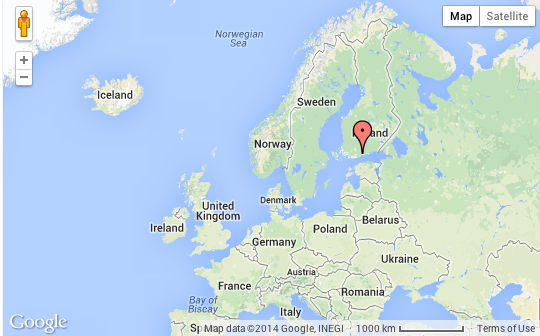 The Blue White Ribbon is an expedition of all of the Finnish Coast, of approximately 1 200 km. The Archipelago Ribbon is a 650 km journey along the history of the South coast of Finland. The newest Ribbon is Vuoksi Ribbon, a lake expedition of at least 450 km, although it is easy to paddle even double lenght along the lakes, as shown on this map. A Ribbon is a tour where you make an expedition you cannot buy with money, and an effort where you join a line of paddlers who did the same earlier or in years to come after your expedition. Local tourism offices might have route maps for paddlers. In Finnish the relevant words would be: kajakki, kanootti, melonta, kanootinvuokraus, kanoottivuokraus, melontakeskus, melontaretket etc. Rentals in Helsinki area: Bear&Water, Melontakeskus, Natura Viva (also tours), Welhonpesä for example. A local kayaking club is also a good contact when planning. 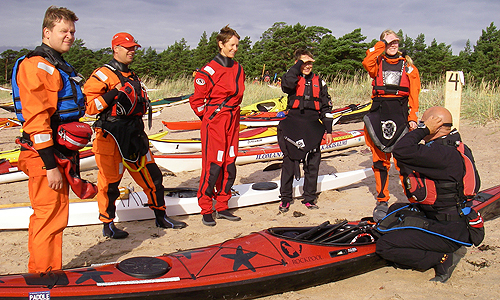 There is also an annual sea kayak gathering in Hanko, the HSKG if you want to meet Finns who paddle. Do not, I repeat: DO NOT pick berries or mushrooms without a finn with you, who knows what to pick. There are several fatally poisonous mushrooms and berries in the forests. You have to be ABSOLUTELY sure what to pick and how to prepare your mushrooms or berries before eating them.